ALS. 1p. Langham Chambers, Langham Place. No date. No addressee but almost certainly to Thomas Miller. 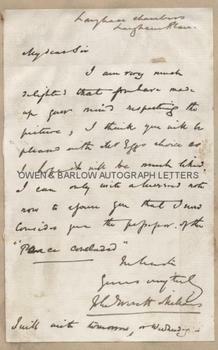 Millais agrees the sale of his picture 'The Peace Concluded'. "I am very much delighted that you have made up your mind respecting the picture, I think you will be pleased with Mr Egg's choice as I hope it will be much liked. I can only with a hurried note now to inform you that I now consider you the purchaser of the "Peace Concluded". In haste, Yours very truly, John Everett Millais." 8vo. Approx 7 x 4.5. 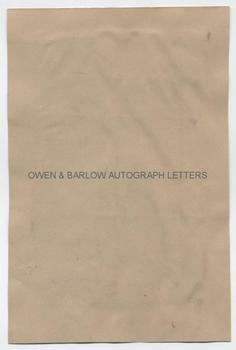 Laid down without integral blank leaf onto album leaf. One or two slight glue stains. VG. Millais first exhibited his painting 'The Peace Concluded' at the Royal Academy in 1856. Despite the hope expressed in this letter that it would be "much liked", it met with mixed reviews. John Ruskin declared it one of the world's masterpieces and other critics compared it favourably to the best works of Titian. Other critics were less enthusiastic (including some other members of the Pre-Raphaelite Brotherhood). Millais sold the painting to Henry Miller of Preston for the considerable sum of £2,000 and it appears from this letter that Mr Miller had used the artist, Augustus Egg, as an agent in choosing the painting for his collection and negotiating the purchase. The central figure of 'The Peace Concluded' is Effie Millais, who had previously been married to John Ruskin. The picture is now owned by the Minneapolis Institute of Arts. 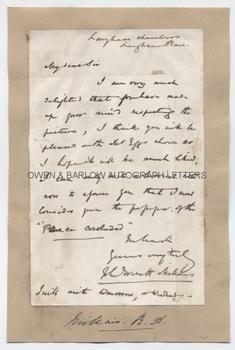 A good Millais letter in which he agrees the sale of one of his major works and which is, unusually, signed with his full name. Provenance: From the 19th century album of Emma Marshall of Penwortham Lodge, Preston. Emma was the daughter of William Marshall, landowner and cotton manufacturer and she was related by marriage to the Miller family of Baronets, M.P.s and landowners.